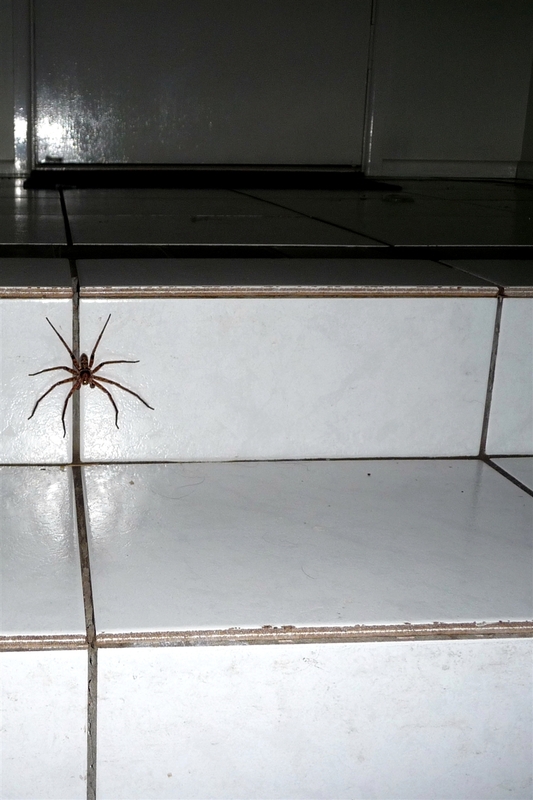 My unwelcome housemate is back, she has the knack for showing up in my ensuite shower. I discovered that Ms Spider had found her way back inside this morning after I had stripped off and was standing in the shower, the spray of the water off my body sent her flying across my tiny shower space smack bang into the clear screen door where she turn tail and headed straight across the shower floor and up the wall into the soap dish. My response was to stay calm and chastise the funny little spider for running into a closed shower screen or not. The truth is I ran screaming from the shower and went into the kids bathroom and finished my shower there. I have two questions for this huge huntsman spider. Why haunt my house and why do you love my ensuite shower? Imagine for a moment that I am a character out of a Harry Potter book/movie who could speak parcel tongue and whisper “why”. What would the spider say? It goes against my nature to kill any living thing but I confess that I have walked down the poison aisle at the supermarket wishing my conscience would allow me to pick up a can of spray and put it in my shopping cart. You know that poison aisle I am talking about, the one in the grocery store that smells really bad. The huntsman has been given me a few scares by popping up whenever I leave a room, I swear she is following me around the house. She is even feistier when I attempt to catch her because she knows all my tactics after our last encounter. What creeps me out is the sound her feet make when she runs across the tiled floors. Somehow I am going to make peace with this unwanted house guest and think about all the other bugs she will be eating in my house that I don’t have the heart to kill.